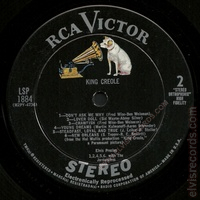 Cover Front: Nipper logo at top right, number at upper left without the "(e)". 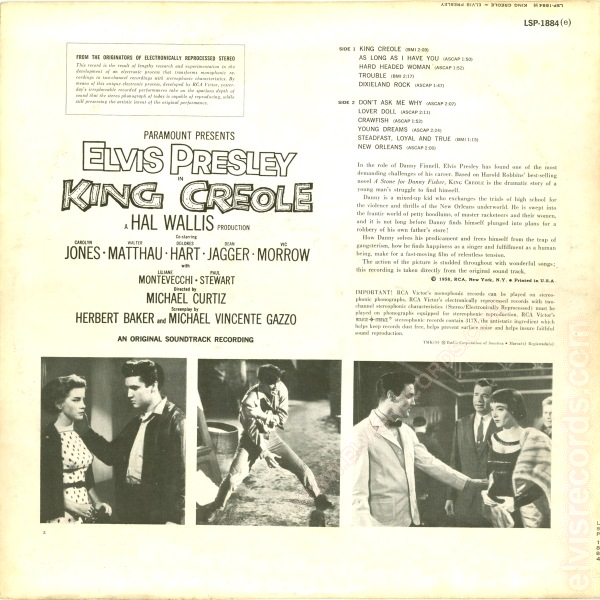 RE lower right corner. Cover Back: Large RCA box upper left, number upper right without the "(e)". 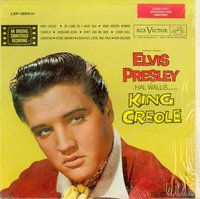 After the third paragraph the copyright info is not bold as © by Radio Corporation of America, 1958 followed by an IMPORTANT! statement. 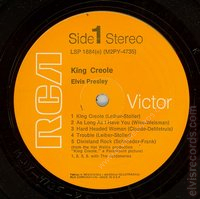 This label is commonly referenced as the staggered stereo release. 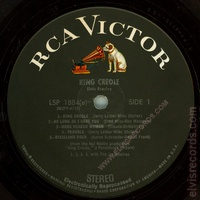 Cover Front: Nipper logo at top right, number at upper left with the "(e)". 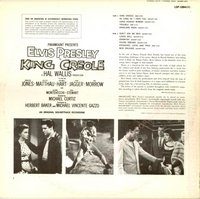 RE lower right corner. 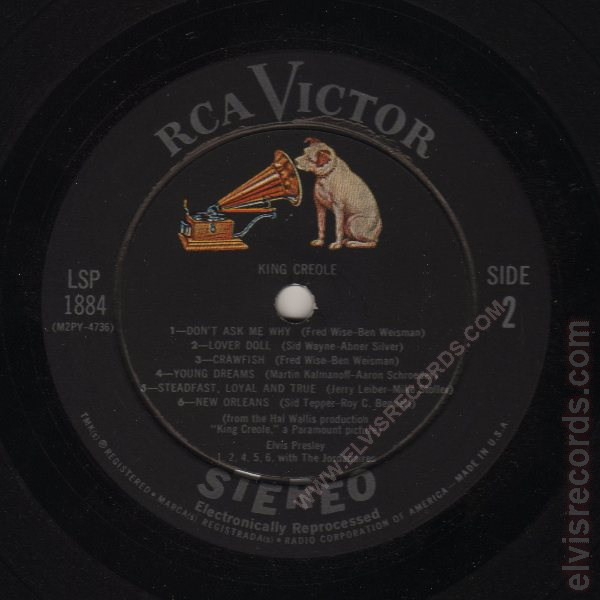 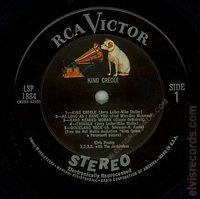 Disc: Black label, RCA logo in white at top and "Stereo" at bottom. (10/1964). On side 1, track 5, abbreviated credits. On side 2, track 5 is on one line with credits abbreviated. Track 6 abbreviated credits. 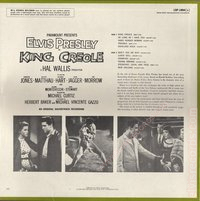 On both sides, (from the Hal Wallis production "King Creole,"" on one line and "a Paramount Picture)" on another. 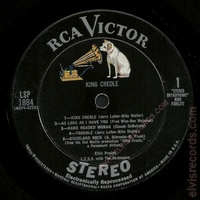 Disc: Black label, RCA logo in white at top and "Stereo" at bottom. 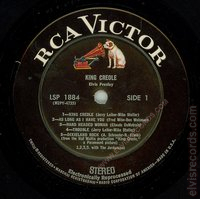 (10/1964). On side 1, track 5, full credits. On side 2, track 5 is on two lines with full credits. 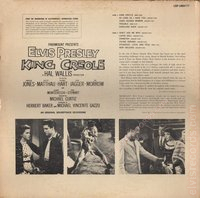 Track 6 full credits. 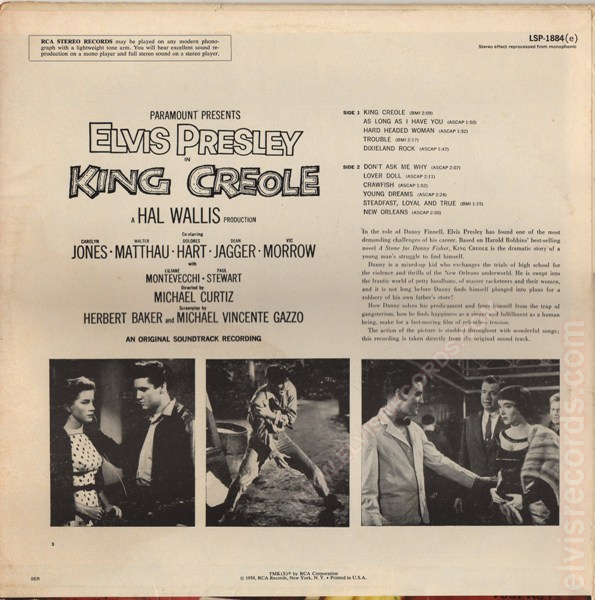 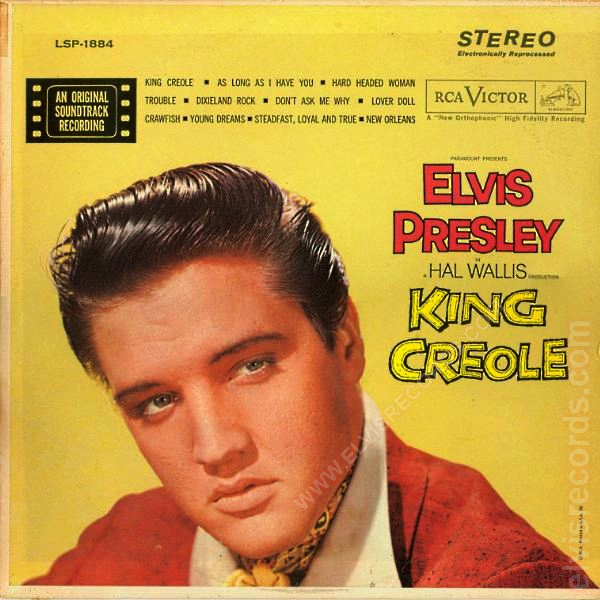 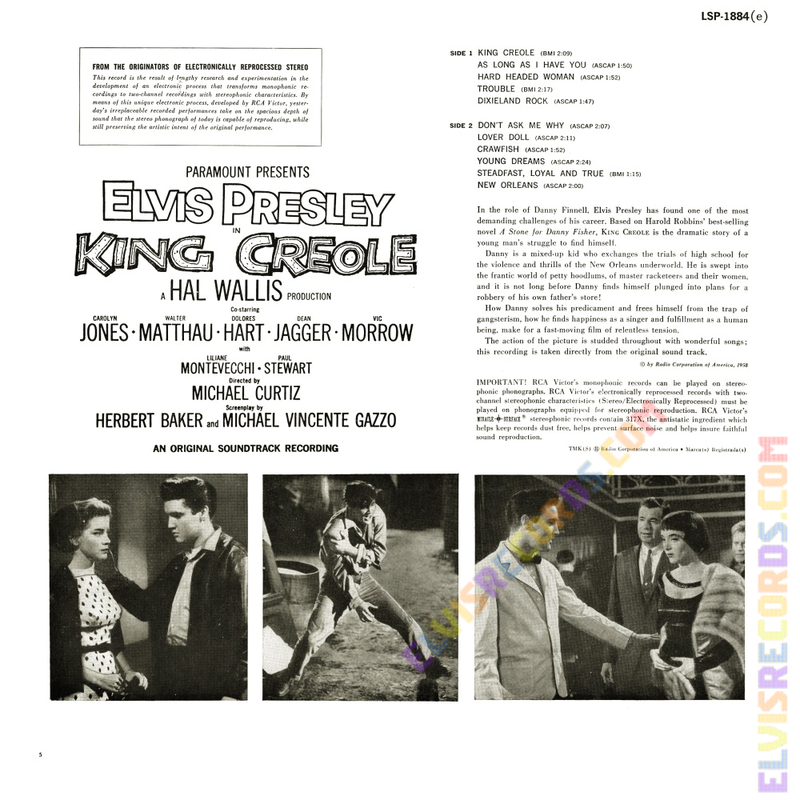 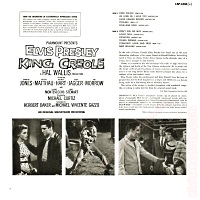 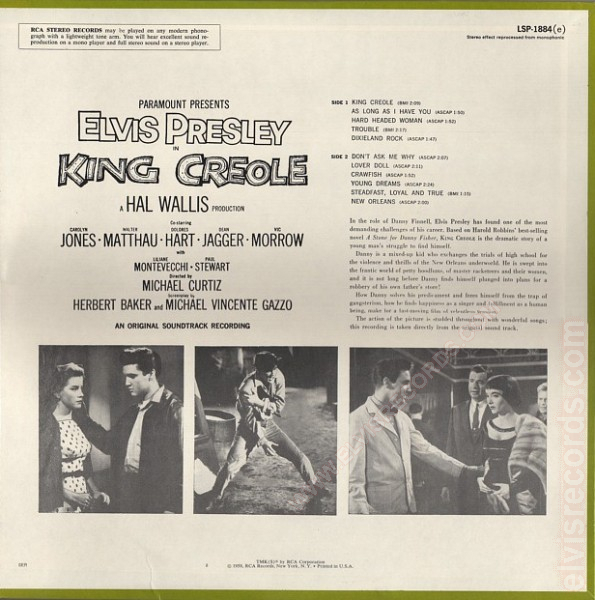 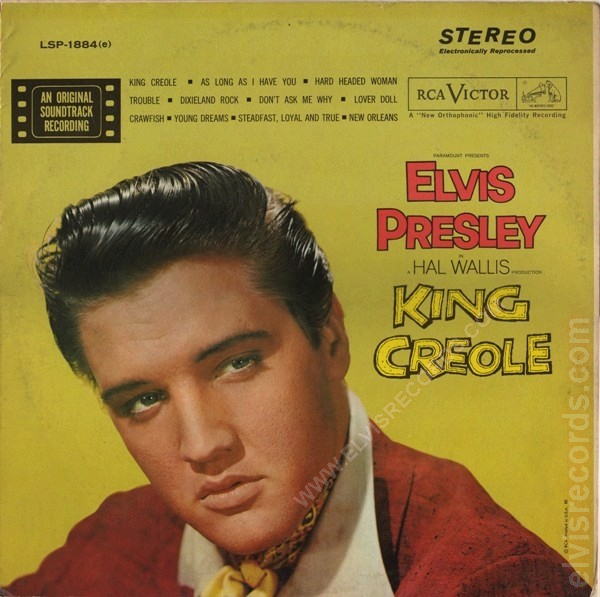 On both sides, (from the Hal Wallis production" on one line and ""King Creole," a Paramount Picture)" on another. 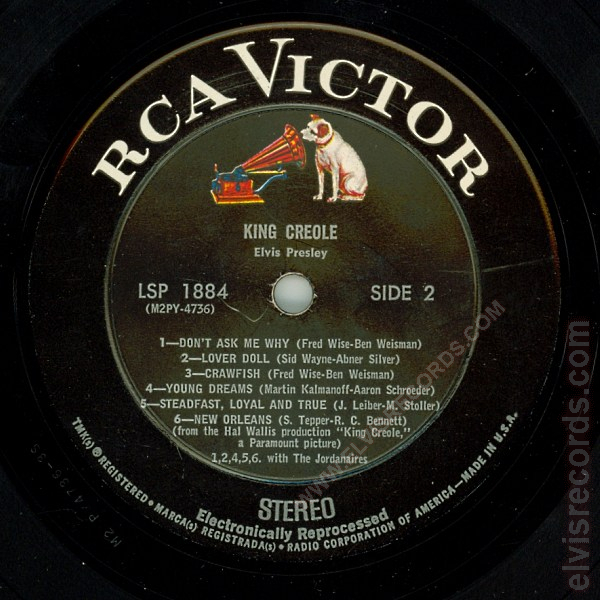 Disc: (1968) Stereo. 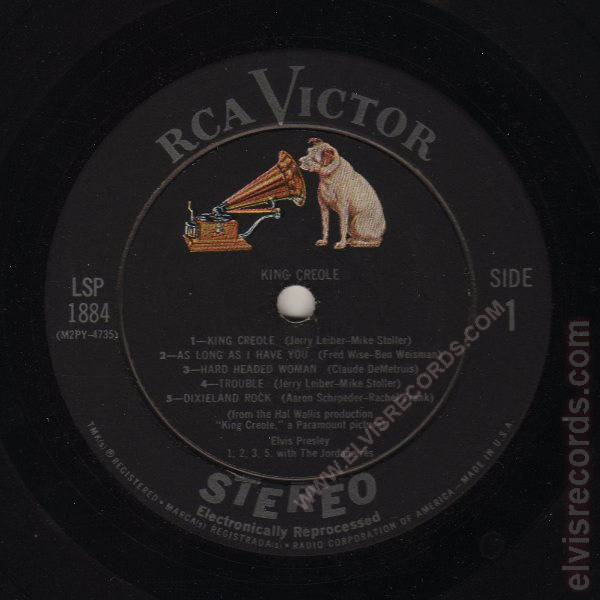 Black label, RCA logo is white, other label print is silver. 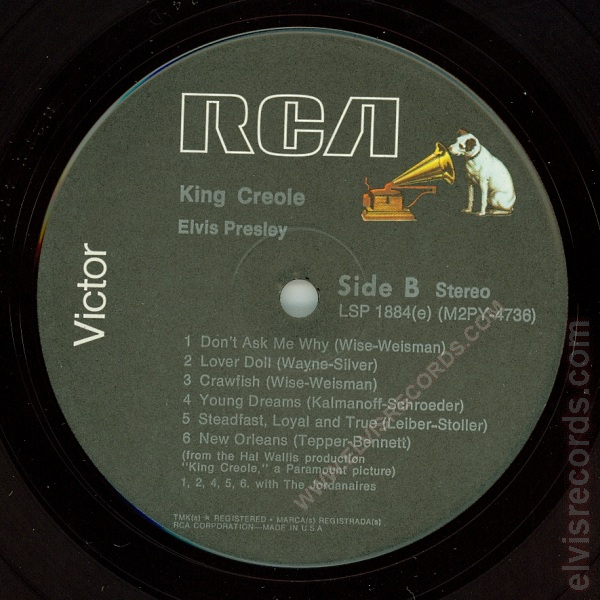 Flat label. 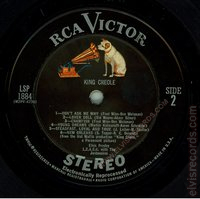 Cover Front: Nipper logo at top right, number at upper left with the "(e)". No number on spline. 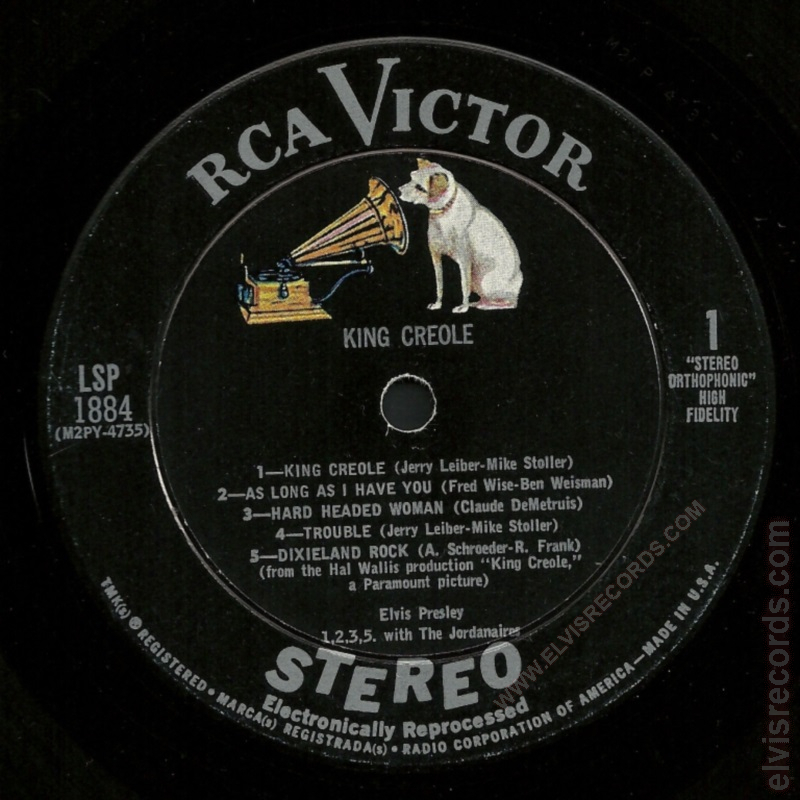 RE lower right corner. 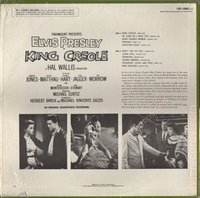 With or without sticker attached to the cover. 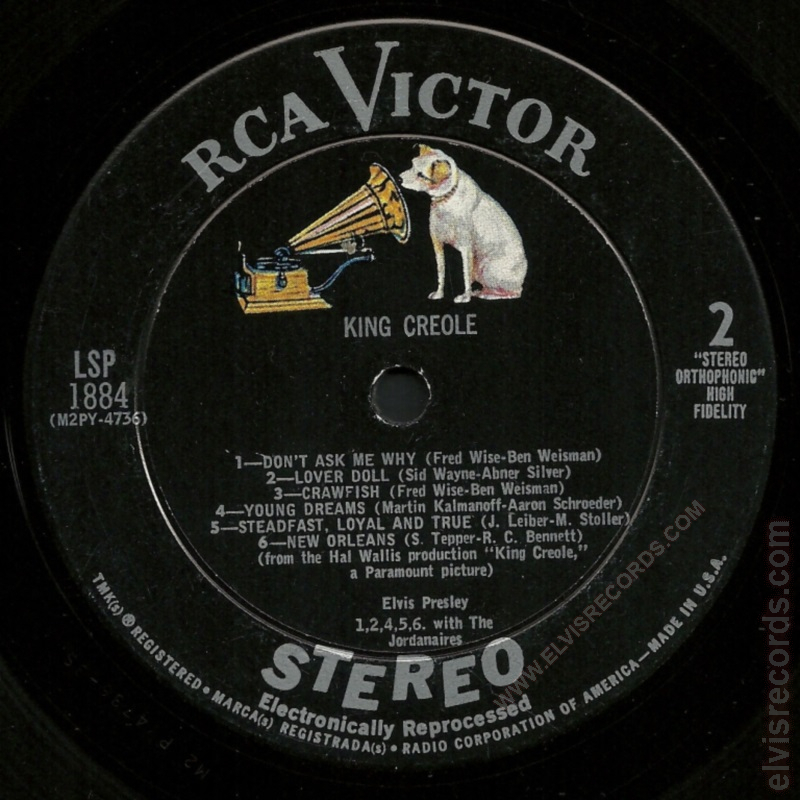 Cover Back: Small RCA box upper left, number upper right with the "(e)" with Stereo effect reprocessed from monophonic line added. After the third paragraph, the copyright info has been relocated to bottom center and IMPORTANT! 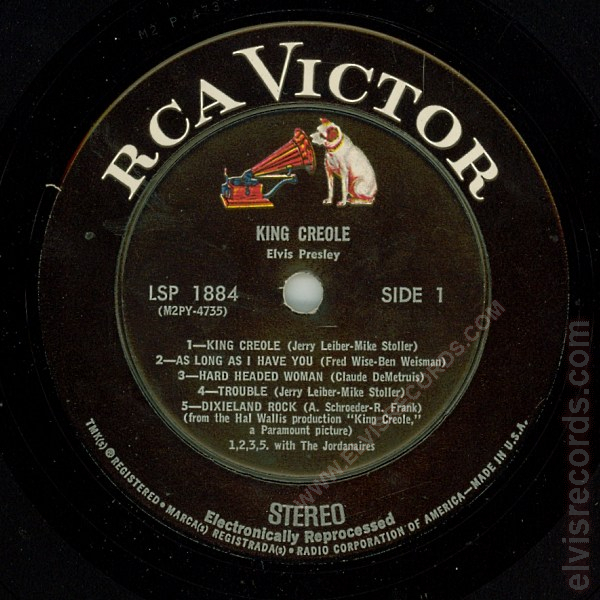 information has been removed. 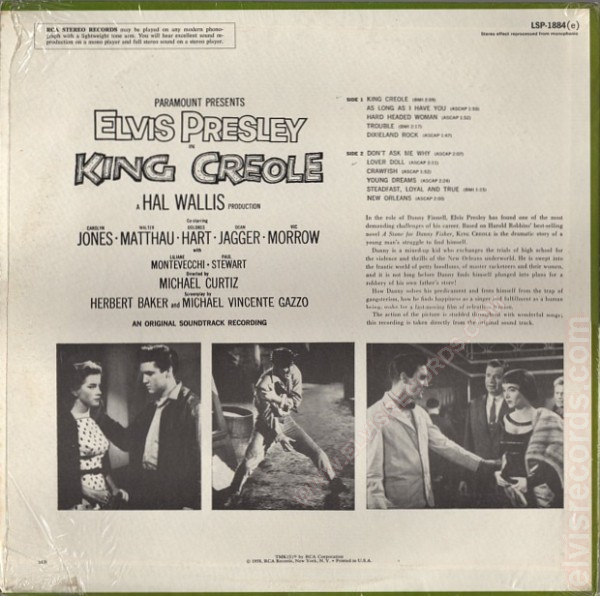 SER lower left corner and the number 3 lower left corner under left farthest picture. SER lower left corner and the number 8 lower left corner under SER. The combination of this front cover in combination with the back cover, has been seen with the following discs and inner sleeves. 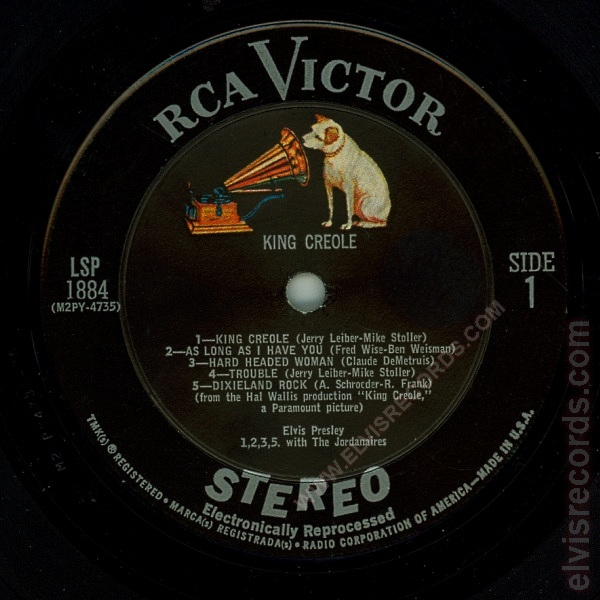 Back: small RCA box upper left, number upper right with the "(e)" with Stereo effect reprocessed from monophonic line added. 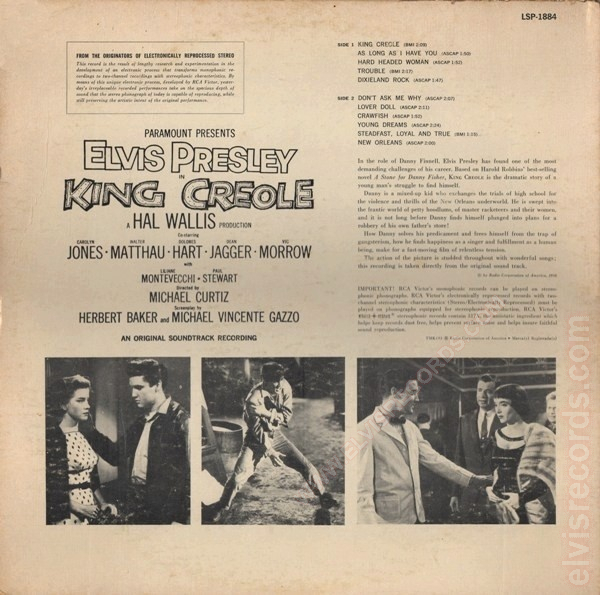 After the third paragraph, the copyright info has been relocated to bottom center and IMPORTANT! information has been removed. SER lower left corner. 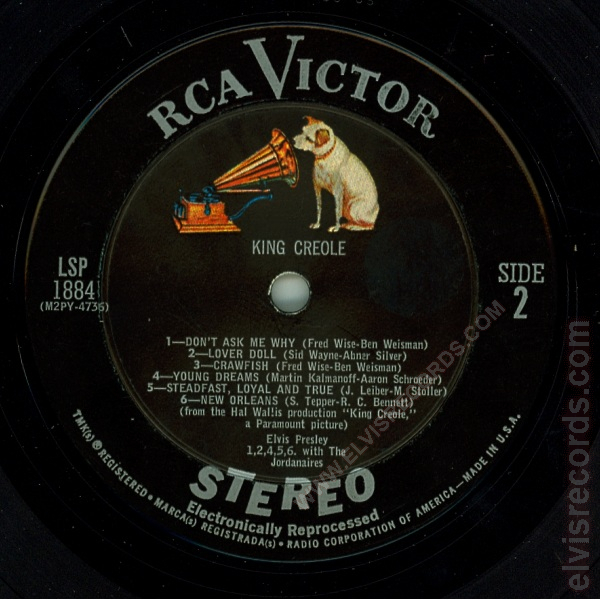 Back: small RCA box upper left, number upper right with the "(e)" with Stereo effect reprocessed from monophonic line added. 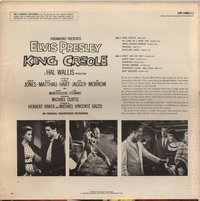 After the third paragraph, the copyright info has been relocated to bottom center and IMPORTANT! information has been removed. 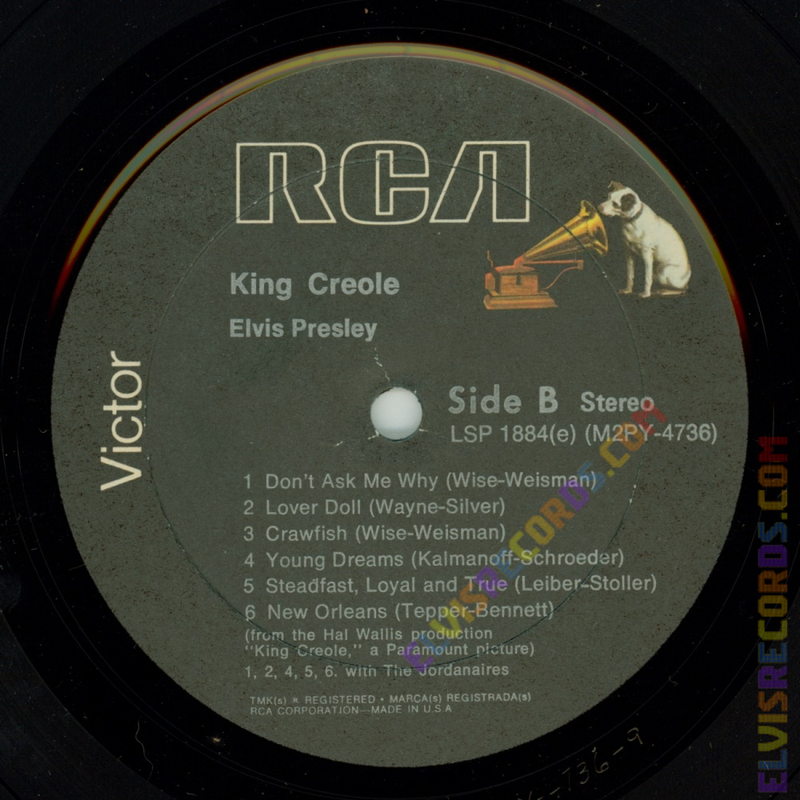 SER lower left corner and the number 2 next to copyright information, bottom center. The combination of this front cover in combination with the back cover, has been seen with the following discs and inner sleeves. 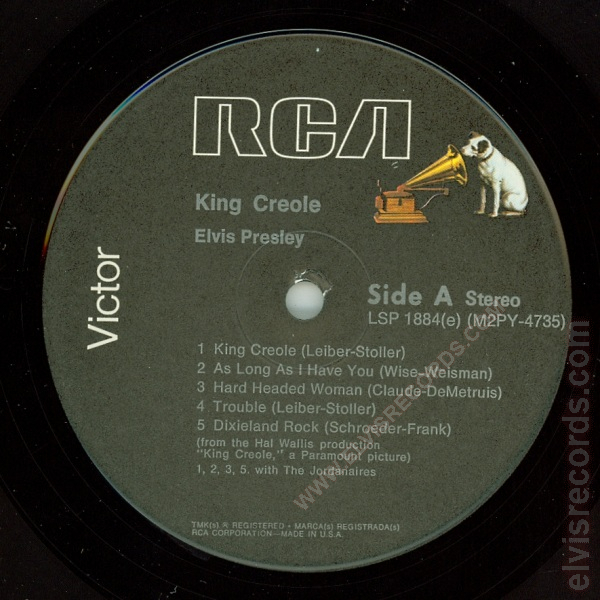 Disc: Black label. Dog near top. 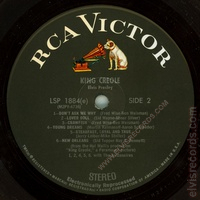 2 3/4" ring. 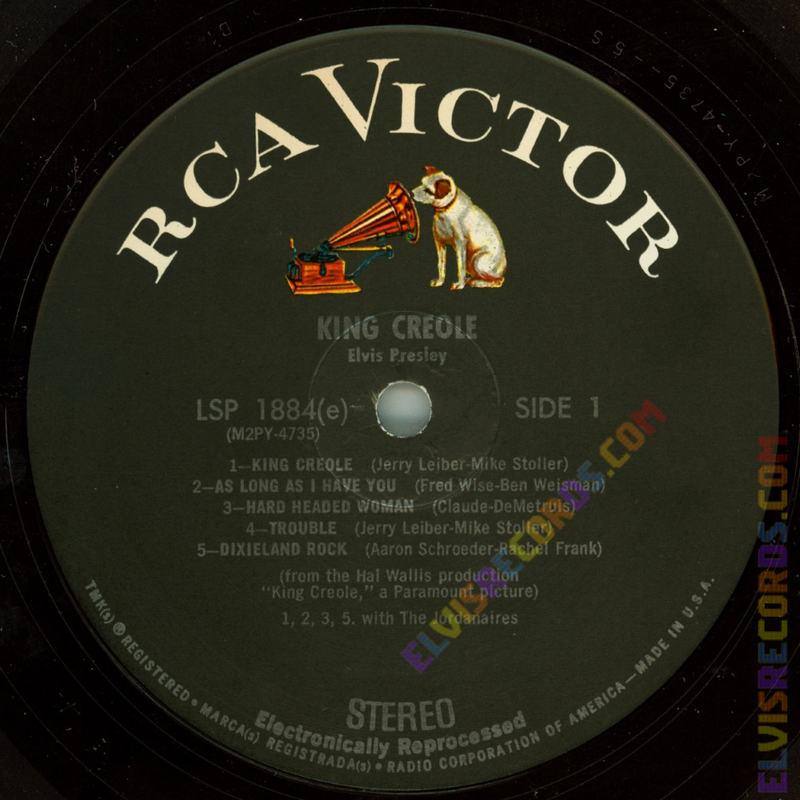 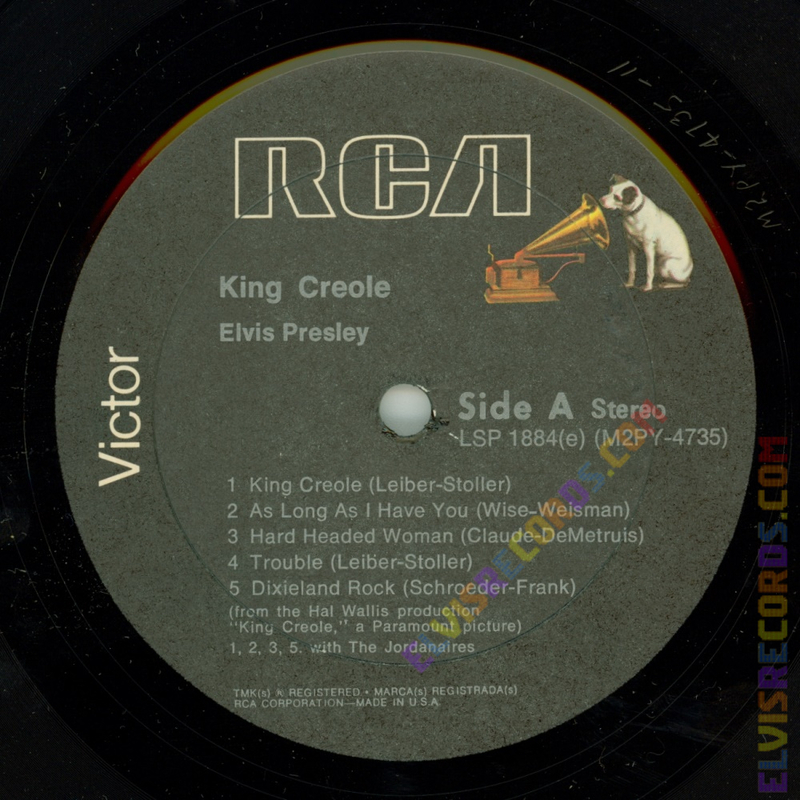 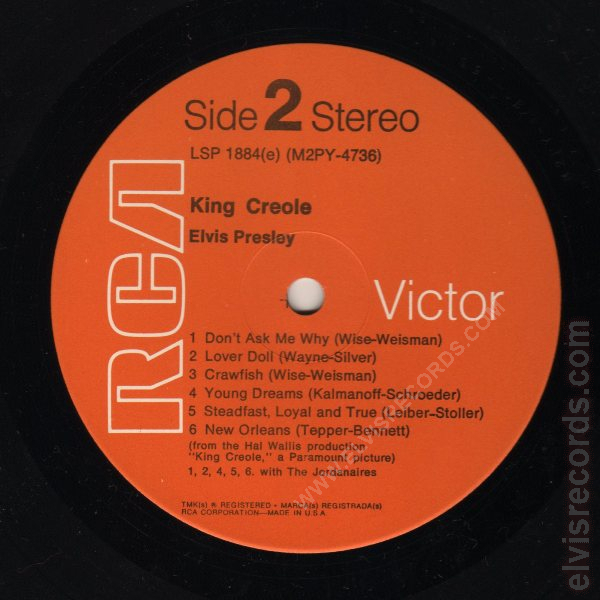 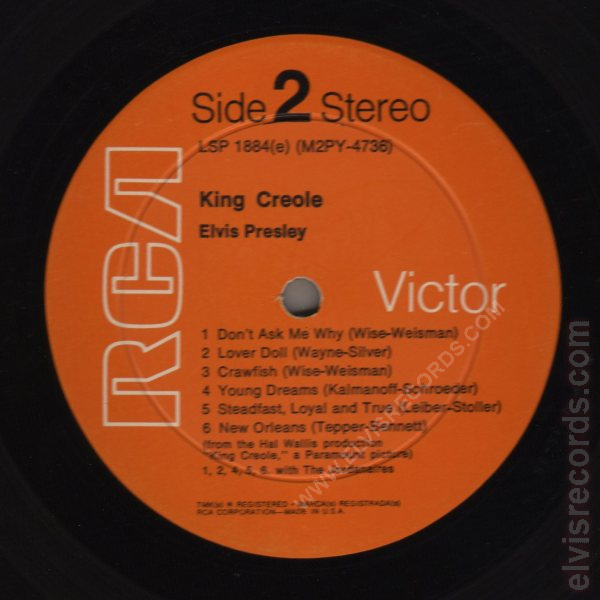 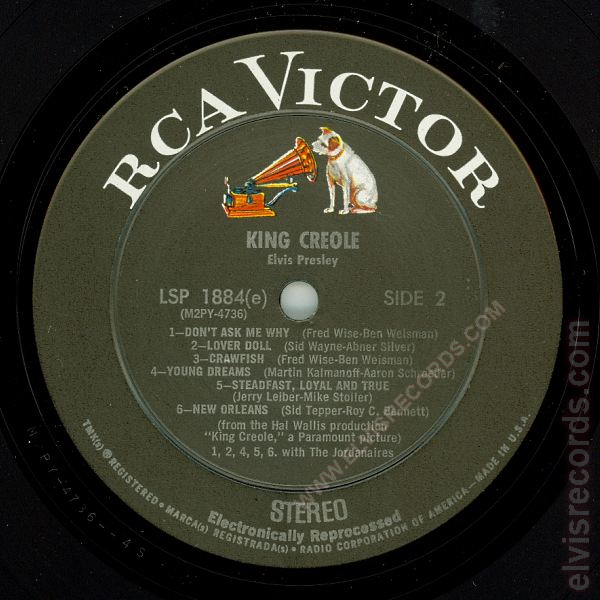 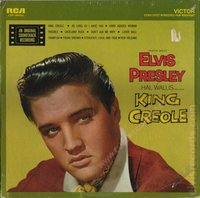 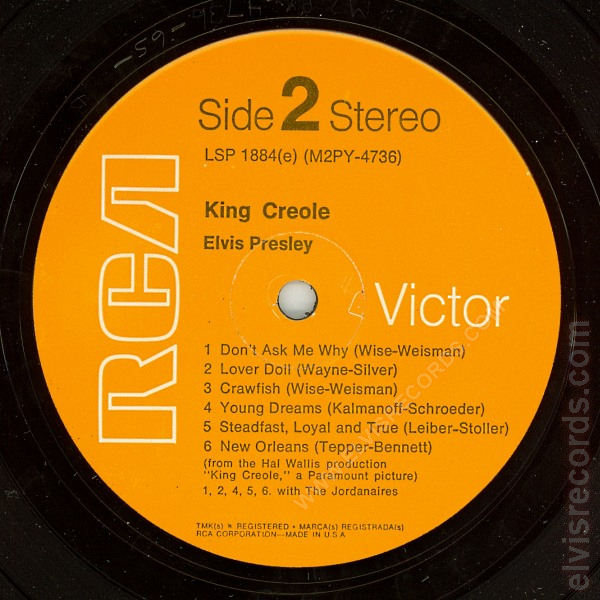 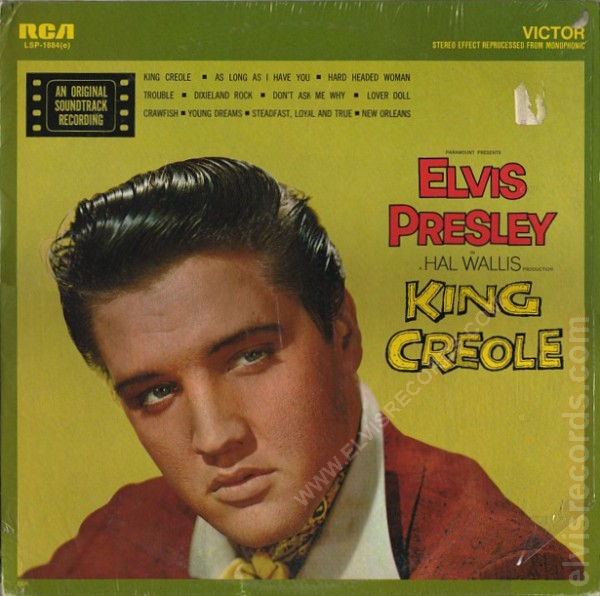 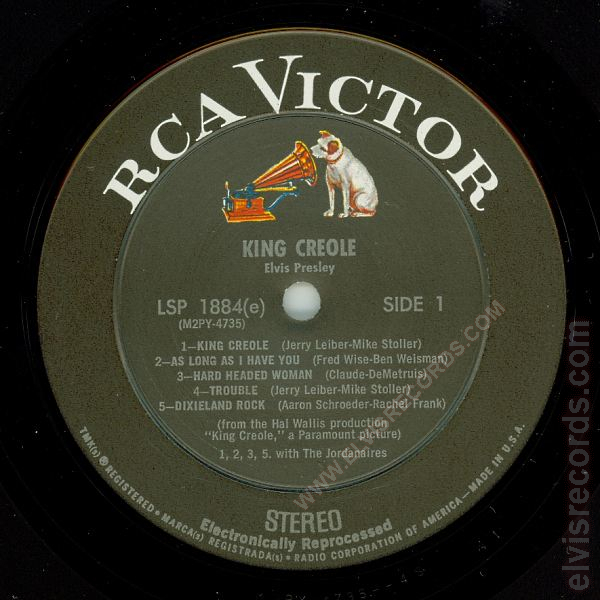 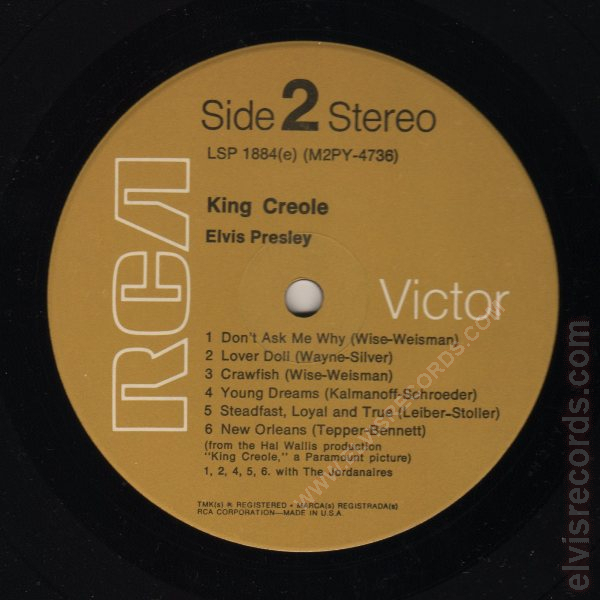 Originally released in monaural as LPM-1884 King Creole and re-released as AFL1-1884 (e) King Creole.